WPP’s plasma gasification process converts the organic waste into a fuel gas that still contains all the chemical and heat energy from the waste. It converts the inorganic waste into an inert vitrified glass, ethanol, biogas, biodiesel, and other various clean fuels with less emissions and much higher efficiency. Plasma is considered a 4th state. Electricity is fed to a torch, which has two electrodes, creating an arc. Inert gas is passed through the arc, heating the process gas to internal temperatures as high as 25,000 degrees Fahrenheit. The following diagram illustrates how the plasma torch operates. The temperature a few feet from the torch can be as high as 5,000-8000º F. Because of these high temperatures the waste is completely destroyed and broken down into its basic elemental components. There are no tars or furans. At these high temperatures all metals become molten and flow out the bottom of the reactor. In-organics such as silica, soil, concrete, glass, gravel, etc. are vitrified into glass and flow out the bottom of the reactor. There is no ash remaining to go back to a landfill. The reactors are large and operate at a slightly negative pressure, meaning that the feed system is simplified because the gas does not want to escape. The gas has to be pulled from the reactor by the suction of the compressor. 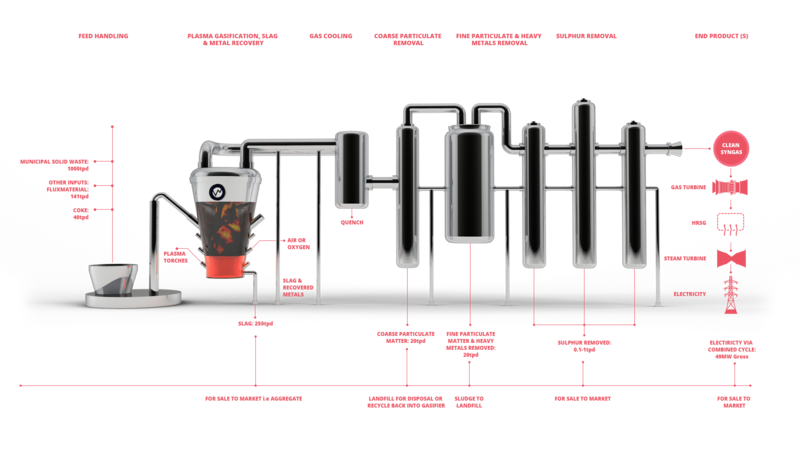 Each reactor can process 20 tons per hour (tph) compared to 3 tph for typical gasifiers. Because of the size and the negative pressure, the feed system can handle bundles of material up to 1 meter in size. This means that whole drums or bags of waste can be fed directly into the reactor making the system ideal for large scale production. The gas composition coming out of a plasma gasifier is lower in trace contaminants than with any kind of incinerator or other gasifier. Because the process starts with lower emissions out of the reactor it is able to achieve significantly lower stack emissions. The gasifier doesn’t care about the amount of moisture in the waste. The moisture consumes energy to vaporize and can impact the capacity and economics, however, it will not affect the process.